Located in Louisville, Kentucky, Oxmoor Toyota in Louisville, Kentucky has a stunning selection of new Toyota Corolla models that you’re sure to love. From its sleek design to its incredible fuel efficiency, the Toyota Corolla is truly in a class of its own. Furthermore, you’ll appreciate that our new Toyota Corolla inventory has been been discounted off the MSRP to help you get the kind of deal you’d expect from Oxmoor Toyota. Call today for more information on our new Toyota Corolla sedans and hatchbacks, or stop in to our Louisville, KY Toyota dealership for an eye-opening test drive today. Factory MSRP: $27,069 2020 Toyota Corolla XSE Silver Door Edge Guards, Rear Bumper Protector, Alloy Wheel Locks, Prem Fabric w/SofTex Sport Seats, 8-Way Pwr Dr w/ Pwr Lumbar, 4-Way Adj Fr Pass Heated Front Seats Audio Plus 8" Touch Scrn, 6 Speakers, HandsFree Bluetooth Phone/Music, USB Media Port, 1 USB Charge-Port SiriusXM w/3-Month All Access Trial Siri Eyes Free, Apple CarPlay Compatible 7-in Color TFT Multi-Info Display Leather Steering Wheel & Shift Knob, All-Weather Floor Liner Package (DISC), All-Weather Floor Liners. 31/38 City/Highway MPG As part of the Toyota family, your exceptional ownership experience starts with ToyotaCare, a no cost maintenance plan with 24-hour roadside assistance.The ToyotaCare plan covers normal factory scheduled service for two years or 25,000 miles, whichever comes first. 24-hour roadside assistance is also included for two years, regardless of mileage. Factory MSRP: $23,400 2020 Toyota Corolla SE Red Rear Bumper Protector, All-Weather Floor Liner Package (DISC), All-Weather Floor Liners, Door Edge Guards. 31/40 City/Highway MPG As part of the Toyota family, your exceptional ownership experience starts with ToyotaCare, a no cost maintenance plan with 24-hour roadside assistance.The ToyotaCare plan covers normal factory scheduled service for two years or 25,000 miles, whichever comes first. 24-hour roadside assistance is also included for two years, regardless of mileage. Factory MSRP: $23,778 2020 Toyota Corolla SE Barcelona Red Metallic 31/40 City/Highway MPG As part of the Toyota family, your exceptional ownership experience starts with ToyotaCare, a no cost maintenance plan with 24-hour roadside assistance.The ToyotaCare plan covers normal factory scheduled service for two years or 25,000 miles, whichever comes first. 24-hour roadside assistance is also included for two years, regardless of mileage. Factory MSRP: $24,269 2020 Toyota Corolla SE Celestite Gray Metallic 29/36 City/Highway MPG As part of the Toyota family, your exceptional ownership experience starts with ToyotaCare, a no cost maintenance plan with 24-hour roadside assistance.The ToyotaCare plan covers normal factory scheduled service for two years or 25,000 miles, whichever comes first. 24-hour roadside assistance is also included for two years, regardless of mileage. Factory MSRP: $21,333 2020 Toyota Corolla LE Gray Door Edge Guards, Rear Bumper Protector, Fabric 6-Way Adjustable Driver seat, 4-Way Adjustable Front Passenger seat Audio, 8" Touch Screen, 6 Speakers, HandsFree Bluetooth, USB Media Port, 1 USB Charge Port Siri Eyes Free, Apple CarPlay Compatible 60/40 split fold-down rear seat 4.2-in. Color TFT Multi-Info Display Auto Climate Control w/ Push Btn Cntrls Remote Keyless Entry System, All-Weather Floor Liner Package (DISC), All-Weather Floor Liners. 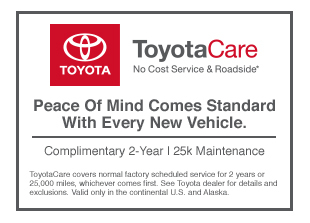 30/38 City/Highway MPG As part of the Toyota family, your exceptional ownership experience starts with ToyotaCare, a no cost maintenance plan with 24-hour roadside assistance.The ToyotaCare plan covers normal factory scheduled service for two years or 25,000 miles, whichever comes first. 24-hour roadside assistance is also included for two years, regardless of mileage. Now that you’ve checked out our new Toyota Corolla inventory, its time to maximize your potential savings. For instance, you’ll find even more deals and new car specials on our offers & incentives page. Then, if you’re ever concerned about monthly payments, you can quickly figure out your payment on our handy payment calculator page now. We’re happy to help you explore all of our Toyota Corolla specials. Get in touch with our auto finance center in Louisville, KY to learn more. When it comes to buying vs leasing a new Toyota car, truck, or SUV, the friendly finance pros at our Louisville, KY auto finance center can help. We’ll go the extra mile to get you a great price and monthly payment on the new Toyota of your dreams. Call now for complete details, or fill out our secure online auto finance application to get pre-approved immediately.